Are you satisfied with your Christian life, or do you get the feeling that something vital is missing? Have you ever wondered - where does the World end, and the Church begin? Is the 21st Century Church truly the best it could be? Are there forgotten places that we really should revisit? Dare we believe that we could return to the Biblical Church of those first apostles? Some say we cannot. Others have tried and failed. Steve Maltz believes it is worth trying again because THE ONE INGREDIENT that is always missing in efforts to revitalize the church, is that we begin and end our effort with a thoroughly Greek mindset. And yet we are, by and large, completely unaware of our Greek mind or the effect it has on our walk of faith. 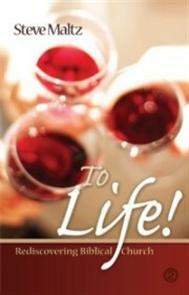 "To Life!" has been written for anyone in the Church who is willing to admit that there are some things that are simply not right and suspect that the answer may be found in a true exploration of the Hebraic roots of our Christian faith. Suitable for individual or group reading, the book is structured in such a way that a local church can work as a family through various points raised and can explore together various suggested courses of action. The cover design and blurb on the back are designed to encourage Christians to explore a whole new world - that many have no idea exists!